The Upper Aquetong Valley Historic District runs along Meetinghouse Road between Aquetong and Sugan roads along the upper branch of the Aquetong Creek. The valley was recognized as a National Historic District in 1987 through the efforts of members of the Aquetong Valley Association, with Jane Hess as president. Like the Cuttalossa District, the Upper Aquetong Valley Historic District is not a village, but rather a valley settled in the 18th and 19th centuries by Quakers from England. When settlement began in the mid 18th century there were approximately 12 tracts owned by now familiar family names such as Eastburn and Paxson. Agriculture was the predominant industry with the growing of grains and keeping of small animal herds. Little has changed along this road over the centuries. Most of the land is still open farm fields and virtually all of the 18th and 19th century homes are still standing, as are many of the barns, corncribs, and springhouses. The majority of the residences are 2-1/2 story rectangular fieldstone buildings of moderate size. The buildings are excellent examples of early fieldstone residences, loosely based on Georgian and Federal styles. They reflect the conservation Quaker style in their lack of ornamentation and stylistic pretensions. 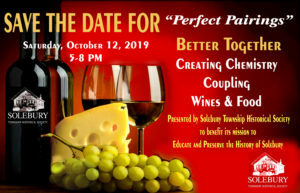 It is interesting to observe that two of Solebury’s most pristine areas–Meetinghouse Road and Cuttalossa Road–were developed in Colonial days as industrial valleys. By the end of the 18th century the number of Quaker settlers had grown sufficiently to warrant the construction of their own Meetinghouse. The Solebury Meetinghouse was built in 1806, patterned after the nearby Buckingham Meetinghouse, from which most of its members were drawn. Today the Upper Aquetong Valley Historic District is little changed from the 18th century. Through the initiative of the Aquetong Valley Association and the landowners, virtually all the land in the valley is protected from further development. Most of the original fieldstone homes and outbuildings still stand proudly, though modified for more modern living conditions. Remnants of the limestone industry are barely visible, covered long ago with dense foliage. The rich agricultural soil continues to bear crops. A walk or leisurely drive along this bucolic road transforms one back some 250 years, to the very beginning of the settlement of Solebury Township. 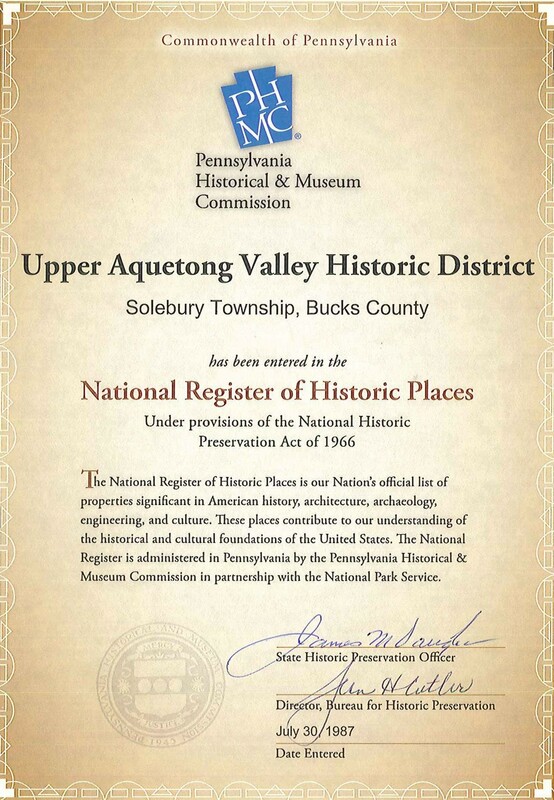 Read more about the Upper Aquetong Valley on the Solebury Township site.